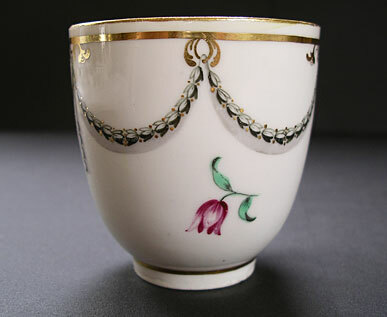 "An elegant William Duesbury Derby period grooved loop handle coffee cup: an intricate neo-classical Husks and Swags pattern with delightful polychrome flower sprigs. 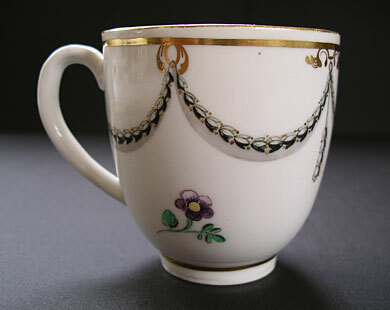 This pattern originates from the Chelsea-Derby period and on this example is decorated at least in part by the Derby painter-gilder William Taylor whose number 11 painter's mark is found in puce to the footrim. 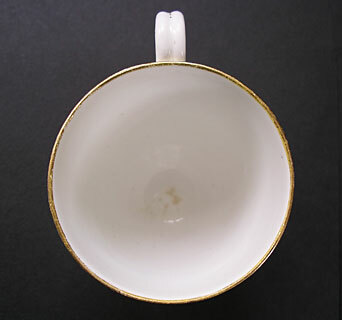 A little gem of an eighteenth century English porcelain coffee cup and recommended to the discerning collector of fine antique china." Antiques Expert Hamilton Bear. 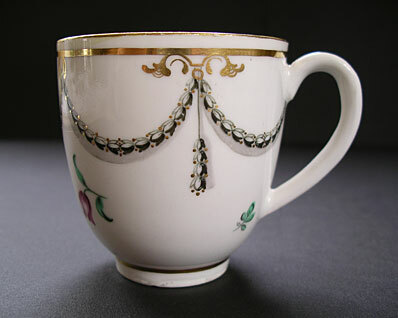 References: This neo-classical pattern is found illustrated on Chelsea-Derby cups in Derby Porcelain 1748-1848 An Illustrated Guide, John Twitchett page 271 numbers 18 and 20. 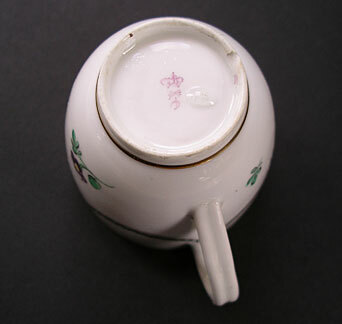 Marks: Derby mark as illustrated plus rarely found Derby painter's '11' for William Taylor. Condition: Excellent condition with no significant damage and no restoration. There are minute specs of rubbing wear to decoration in places - visible with a magnifier but not noticeable in normal view. 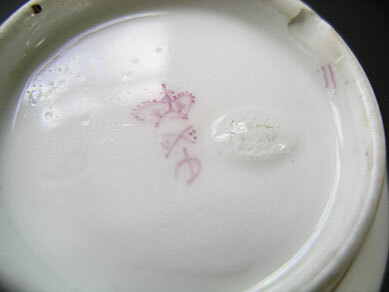 To the base there is a flat firing chip to footrim caused by removal of kiln furniture; a raised pottery bubble to flat of base underneath - also from firing and a brown spot of glazing impurity to footrim. 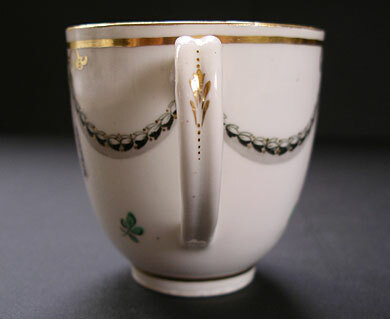 Overall a nice example of a rare eighteenth century porcelain cup.